Rehabilitation Services Administration Commissioner Visits the Learning Academy! 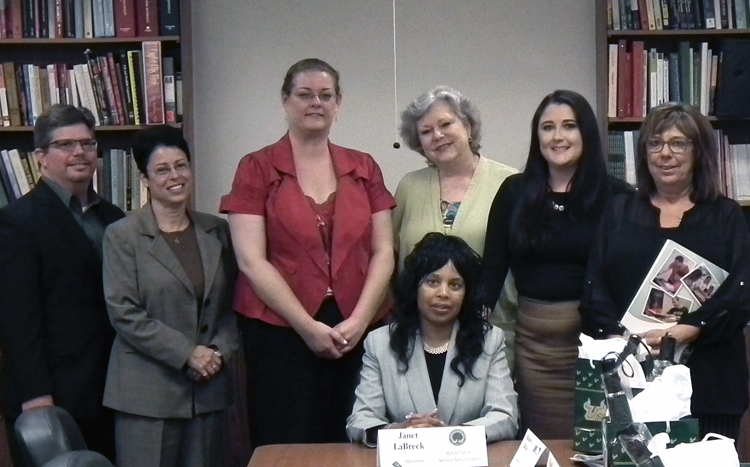 On July 9, 2014, Janet LaBreck, Commissioner of the Rehabilitation Services Administration (RSA), visited the University of South Florida, along with RSA Program Specialist Christyne Cavataio and Department of Education Chief of Staff Kathy Hebda. Accompanying Commissioner LaBreck were Aleisa McKinlay, Director of the Division of Vocational Rehabilitation, Robert Doyle, Director of the Division of Blind Services, and John Howell, Area Director, Division of Vocational Rehabilitation. Three programs were showcased for their work in training and research for vocational rehabilitation. Among these were two College of Behavioral and Community Sciences programs: the Department of Rehabilitation and Mental Health Counseling and the Learning Academy and Employment Services, Department of Child and Family Studies. The visit focused on programs that support the RSA’s mission to establish a job-driven vocational rehabilitation technical assistance center to offer training and technical assistance to those with disabilities. The overarching goal to help provide skills and competencies to those with disabilities fits with these CBCS programs, as well as USF’s Rehabilitation Engineering Program and its Center for Assistive, Rehabilitation & Robotics Technologies (CARRT), which was also showcased for Commissioner LaBreck. The Learning Academy and Employment Services program helps provide individuals diagnosed with Autism Spectrum Disorder with the skills needed to engage in competitive employment. The academy offers a customized transition program that assists in preparing young adults diagnosed with Autism Spectrum Disorder for employment. The Learning Academy provides services, supports and experiential opportunities that develop and enhance each student’s independence in meeting personal career goals. You can see student success stories at the center’s main website. The Learning academy will welcome its 6th class in late August. The employment services component accepts participants on an ongoing basis.